Has your library decided not to apply for E-Rate funds because of the filtering requirements? Do you get E-Rate or LSTA funds that require filtering but you aren't sure if you are in compliance? If our library doesn't filter, are there other laws we should be worrying about? When does patron Internet use shift from Free Speech to Harassment? Is there anything new in filtering technology? 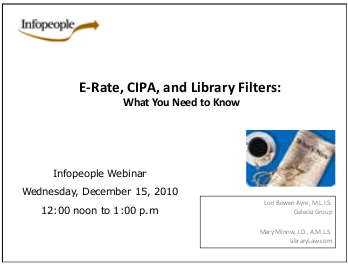 Mary Minow (LibraryLaw.com) and Lori Ayre (LibraryFiltering.org) will provide answers to these questions and more as they revisit the issues related to filtering, CIPA, and the often-confusing laws that libraries must navigate. Each speaker will explain the elements that libraries need to address when developing or revising their Internet Use Policies and using technology to enforce them. Whether you apply for E-Rate now or are wondering if you should, this webinar will provide useful tools for navigating these sometimes muddy waters.